Here I was all psyched for the first dragon boat practice of the season, and I missed it! *gasp* Which resulted in my pouting last evening for a good chunk of time, sigh. This stupid cold! It keeps getting worse, yesterday saw the onset of an oh-so-lovely cough but none of my other symptoms went away, how is that fair? You’d think with every new symptom you’d get rid of an existing one…at least that is how it would work in a universe run by me…buuuuut nope! I texted a friend on the team and told her I couldn’t decide and she said I should stay home, no way being on the water at night, in the cold, getting wet and paddling were going to do anything but make me sicker which was a very valid point. I decided to take her advice hence no practice. The whole evening I kept looking at the time and thinking “right now they are warming up”, “right now they are loading on to the boat”, “right now they are paddling and seeing what the new coach is like”…ugh, I was so jealous of all of them! I wanted to be there so badly but I couldn’t deny I would have had a hellish time because of the whole not-breathing-constantly-needing-kleenex-coughing-a-lot situation I was dealing with. In a lame attempt to make myself feel better I made some comfort food. I cooked a batch of sticky rice in coconut milk instead of water then topped it with sliced mango. It is a Filipino dish that I really like. The coconut milk makes the rice a tiny bit sweet and the mango topping, well, do you need words to describe the yummy value of mango? Nah, course you don’t! Everyone knows mango is great! 🙂 …um, if you haven’t tried mango go grab one from the produce section of your grocery store, totally worth it! 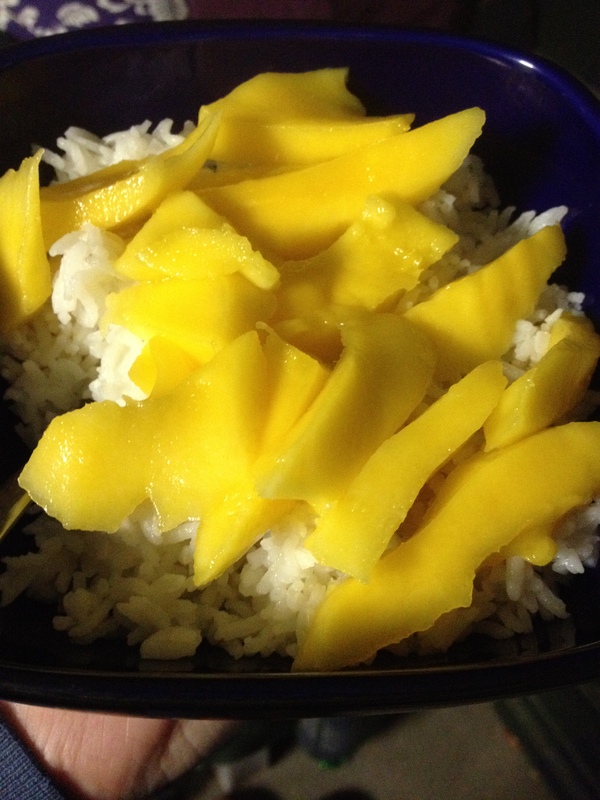 mango on coconut rice, yum!